After our delicious Israeli breakfast, we attend the mounted parade through the streets. Then on to visit the Beersheva War Cemetery for the official Commemoration of the Centenary of the charge. Breakfast, then head off for the a therapeutic “float” in the medicinal waters of the lowest point in the world – The Dead Sea. Then on to visit the site of Masada, built by Herod for palaces for himself and fortified the site between 37 and 31 BC but most know the history of the siege by the Roman Empire ending in the mass suicide of the 960 Sicarri rebels and their families who were hiding there. We will then continue journey to Ein Gedi to visit the Spring’s where David hid from King Saul, driving through the Judean Hills we will follow the progress of the Desert Mounted Corps as position after position was secured on the road to Jerusalem. For those retuning home or elsewhere there is a transfer arranged to Ben Gurion Airport. Airport assistance, touring expenses in all countries visited with an English speaking tour guide in modern air-conditioned coaches, nightly accommodation in 3 or 4 star hotels, majority of hotel and airport baggage handling, all entrance fees and meals where indicated (Breakfast – Dinner). 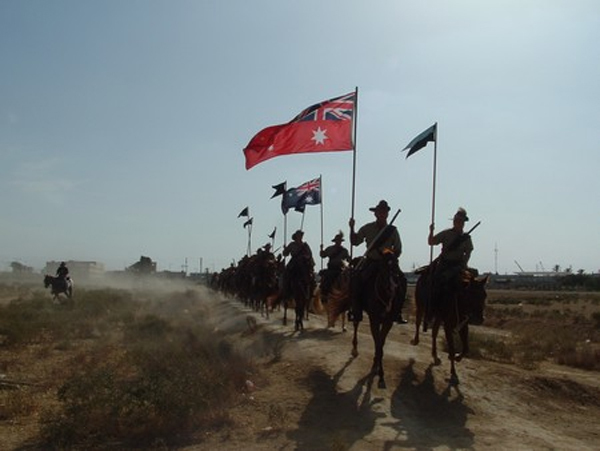 A large Australian Light Horse contingent plan to re enact the ride in 2017, the 100th Anniversary of the great charge.